Rounding the Spring Hill oval: Should it stay or go? There’s no end to the fascination we seem to have with traffic roundabouts, either for or against. Take, for example, that little traffic circle — an oval, actually — on Albany’s Spring Hill Drive at Quarry Road. The thing was put in to handle detour traffic during the North Albany Road project. Because it is far too small to function as a true roundabout, Benton County planned to have it removed once it was no longer needed. But last week, the Albany City Council asked the Benton Board of Commissioners to keep it in place, and the county board agreed. Now someone in North Albany has started a petition asking both the city and county to get rid of it. Why keep it, they are asking, when it doesn’t meet roundabout standards and is no longer needed because that intersection no longer has unusually heavy traffic? Councilman Floyd Collins has two sensible reasons: It slows southbound traffic, which would sometimes rip along that residential part of Spring Hill at 60 mph. And keeping it in place saves the $42,000 it would cost to restore the intersection to its previous configuration. 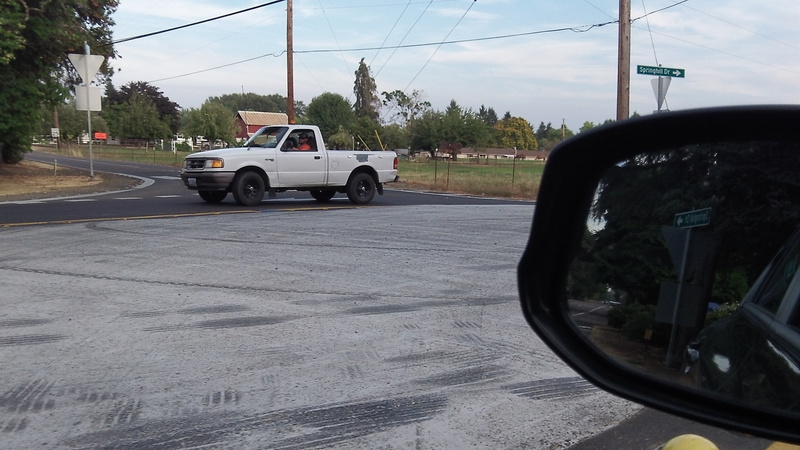 But here’s the thing: At that joint council-commissioners meeting on Aug. 18 in Corvallis, Benton Public Works pledged to consider expanding the roundabout to proper size, which would require buying additional right of way. I wondered what the expansion would cost. Josh Wheeler, the county public works director, says no estimate of the cost has been made. But I’ve heard that $200,000 would not be an unreasonable amount for such a project. As a resident of Nebergall Loop and a frequent user of the oval-about, I agree that as it currently exists, it is unsafe. I consider entering from Nebergall as it having a stop sign. The oval-about is so small that entering it is unsafe unless there are no cars coming from Springhill…because they do not yield. The dmv driver’s manual does not address the right of way issue except to say “who ever is in the traffic circle” has the right of way. I vote for it’s removal. To solve the speeding problem on Springhill, speed bumps such as those on Marion and Southshore would help solve the problem, and for a whole lot less money. They had a bad 15 minutes when they made the decision to keep this egg shaped thing without even the most elementary analysis as to how it impacted safety. Regards to “safety…” How many accidents have occured since it was built? “Normal” traffic on Quarry and Nebergal does not warrant a traffic circle. The old Stop signs worked perfectly well. As a frequent walker on Spring Hill I do think speeding is an issue, made worse since the construction on North Albany Blvd. Some simple traffic enforcement, every once in a while, from the police department would probably be enough to get the average speed back down. We used to live a block over from this intersection, but not since this oval was put in. We have driven through it from all directions and it’s a headache as roundabouts go. Take it out completely, put stop signs on Springhill Road to make it a four-way stop. Coming off Quarry Road, the shrubbery, trees, etc. poke out far enough that they block your clear line of sight to the north. It’s a gamble, you have to inch out too far before you go. Just make it a four-way stop to make the entire intersection safer and to keep the cost down. That orange power pole is an accident waiting to happen. Thanks for pointing out that the Benton County Roads Department is strapped for funding and the new improved version of the round-a-bout might cost up to $300k. And take land from already small lots? I just drive over it. My truck has a hard time with that corner. Problem solved! What! “..$42K” to remove it!!!!! What are they going to use…gold plated shovels??!! Drive a front end loader thru it to remove the buttons, coat the area with black top paint, repaint the lines & be done with it. Mr Holman has a viable idea… Make it a 4-way stop. Since Benton County has “allowed” so much urban growth over the years you now have a residential street basically. Treat it as such. Lower the speed to say 35 MPH for additional safety.